While distinct in format and approach, this Bible study builds on the foundation and carries forward the philosophy and ideals that shaped DISCIPLE — high-commitment, long-term, disciplined study that fosters community and builds toward transformation. Jesus in the Gospels focuses on the portraits of Jesus found in the four Gospels — Matthew, Mark, Luke, and John. The word in used in the title signals that this study takes an approach different from the familiar "life and teaching of Jesus" approach of reading stories and accounts of what Jesus said and did in order to draw conclusions about their meaning and about who Jesus was. This study looks at the way each Gospel writer presents events and teachings and at the picture of Jesus that emerges in each of the Gospels. 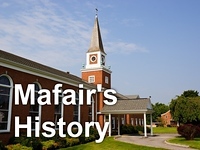 The study will be offered at Mafair beginning with orientation on September 8th. The class will meet on Monday evenings. Class size is limited to 15 participants because of the nature of DISCIPLE studies. For more information, or to sign up, please contact Carolyn Kidd at carolynkidd@charter.net or the church office.